I love carrot cake. Like really, really love it. The light crumb studded with walnuts and raisins, the cream cheese frosting, the fact that it counts as a serving of vegetables (no? it doesn’t?). Since I can’t get away with regularly eating carrot cake for breakfast or snacks, I’ve come up with a good solution: vegan carrot muffins. These muffins aren’t like most in that they aren’t cupcakes masquerading as breakfast. 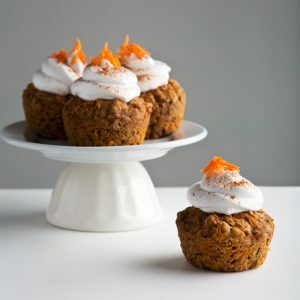 They look a little like cupcakes thanks to that dreamy coconut whipped cream, but the ingredients are actually very wholesome, which is why I’m calling them “hippie” carrot muffins! They use whole grain spelt flour, almond milk, a flax “egg”, a little coconut oil, lots of shredded carrots, and some coconut sugar for sweetness. You can decrease the coconut sugar even further (see my recipes notes) if you want a just barely sweet carrot muffin, or fold in some raisins too if you like. Right before serving them, I like to add a generous sprinkle of cinnamon to make them extra cozy and comforting. 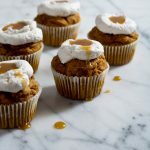 If you’ve been craving carrot cake but want a healthier, less sugar-bomb option to enjoy, give these vegan carrot muffins a try! You might even have all 10 simple ingredients on hand already, plus they only take 30 minutes to make! P.S. Still thinking about real-deal dessert carrot cake? I hear you. 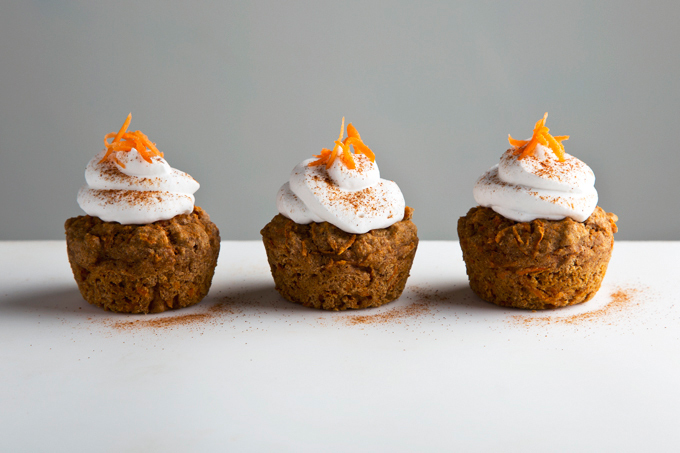 Bake up some of these vegan carrot cake cupcakes. 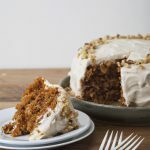 They’ll make your carrot-cake-loving heart sing. Easy vegan carrot muffins made with whole grain spelt flour and lightly sweetened with coconut sugar. They're topped with a simple, dairy-free coconut whipped cream and take just 30 minutes to make! Make the muffins: Pre-heat the oven to 350° F. Lightly grease or line a muffin pan. 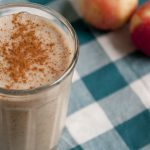 Prepare the flax egg by combining the ground flax seeds and warm water. Stir and allow it to thicken for 3 minutes. In a large mixing bowl, combine the almond milk, coconut sugar, vanilla, and prepared flax egg. Sift in the flour, baking powder, baking soda, cinnamon, and salt. Mix the batter until just combined, then mix in the coconut oil (doing this last prevents it from clumping). Fold in the shredded carrots. Transfer the batter to the prepared muffin pan, filling each tin to the top. Bake the muffins for 18-20 minutes, or until a toothpick inserted in the center comes out clean. Allow to cool completely. Make the coconut whipped cream: Open the can of coconut milk and scoop out the top layer of solid coconut cream into the bowl of a stand mixer. (side note: save the remaining coconut liquid for smoothies!) Mix the coconut cream, powdered sugar, and salt on low speed until combined, then crank it up to high speed for 1 more minute until light and fluffy. Spoon a dollop on each muffin (or pipe it on with a piping bag) then sprinkle with cinnamon. For just barely sweet muffins, decrease the coconut sugar to ⅓ cup. For more natural sweetness, fold in ½ cup raisins with the carrots. I like to use an ice cream scoop to evenly portion out the batter into the muffin tins. For this recipe, I use one full scoop per muffin tin. *I use Trader Joe's full-fat, canned organic coconut milk. You can use your favorite brand, but be sure to stay away from coconut milks with stabilizers and gums because the cream won't separate even when refrigerated. Leftover coconut whipped cream can be stored in a container in the fridge for 5-7 days. The whipped cream will harden when cold, so mix it on high speed until it's light and airy again before using. 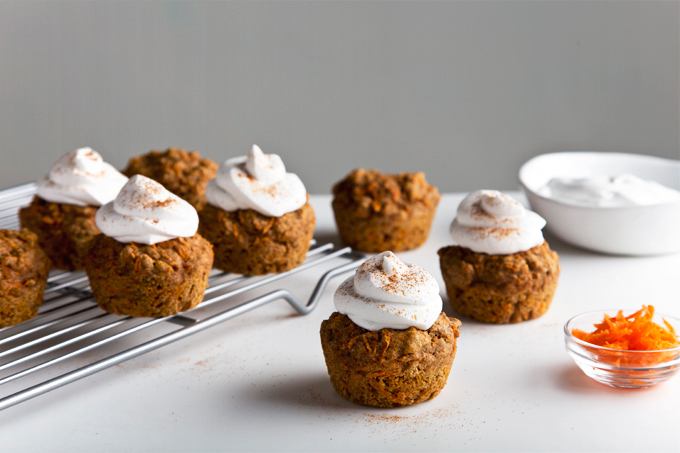 Adapted from my Oil-Free Apple Cinnamon Muffins. im sold on the topping mostly 😛 i will have to make these for breakfast very soon! These muffins look really good!! Muffins have always been some of my favourite things.. can’t wait to try this! Such a great recipe name! haha I do have all of these ingredients so these muffins will be happening ASAP! I made these this afternoon and they turned out great! I followed your recipe and your suggestion to add raisins. These muffins are my new favorite. Thank you! That whipped cream is positively heavenly. Pinned for later this weekend! I made these and didn’t have any coconut oil on hand so I subbed 1/4c unsweetened apple sauce. Also baked them in a jumbo muffin pan & they came out wonderfully. Thanks for the recipe! So happy to hear that your substitutions were a success! I think I need a jumbo muffin pan in my life—sounds amazing! I don’t have spelt flour. Can I use whole wheat pastry flour instead? And if so his much? These muffins are incredibly moist and flavourful. Adding to my favourites list! I don’t have spelt flour, can I use gluten free flour? Would it work out? Thank you! A gluten-free baking blend should work!